Found one file extension association related to TypeIt4Me and 1 file format developed specifically for use with TypeIt4Me. Developer / company: Ettore Software Ltd. Available since 1989, TypeIt4Me is the original text expander for Mac OS. Any time you enter text in your Mac by typing it at the keyboard, TypeIt4Me can help you do it faster and more accurately. Define a number of abbreviations and the full text (or picture) clippings that they represent, then watch the Mac expand them on the fly even as you continue typing. 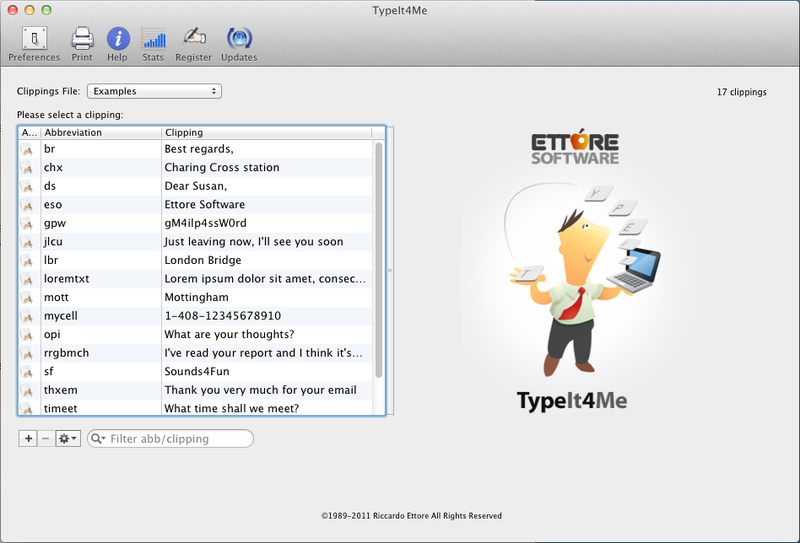 If you need more information please contact the developers of TypeIt4Me (Ettore Software Ltd.), or check out their product website.